There’s a rule in blog-land that you aren’t supposed to take continued hiatuses and then pop in every now and again with a “wow I haven’t posted here in FOR-EV-ERRR” type of post. Well, whatever, dude. I’ve actually got a decent excuse this time around; I had a daughter. Now, your mind is probably blown to smithereens right about now. First I get married and then I up and generate spawn? I’ve tried to write this post at least a dozen times, waxing poetic about how this wonderful ball of feminine badassery has blessed my life to the nines, and each time I’ve hit “delete” and started anew. There’s just not a lot of words that can accurately express how I’ve felt from day one in the hospital to now, almost two months later; I say this as someone going into writing as a profession. 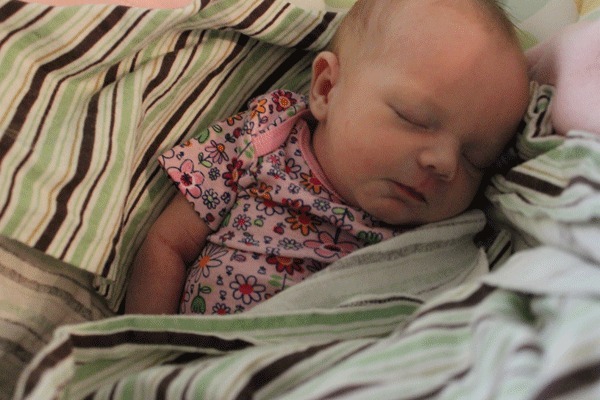 So instead of delving into the understatement of the year territory, I’m going to give you some relevant stats about my daughter and deluge you with adorable pictures. Sound like a plan? Good, because it’s happening!